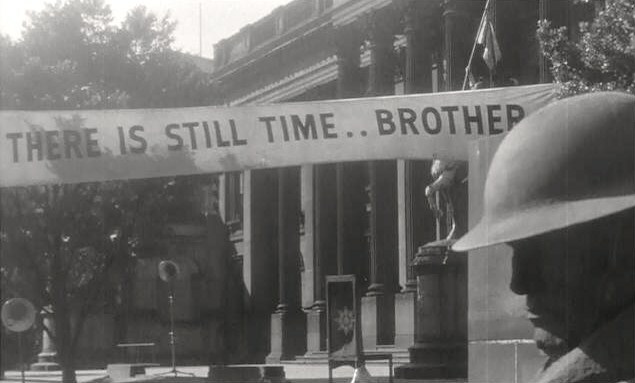 When you make dystopian sci-fi today, you expect it to come out as some sort of action movie; when you made it in the 1950's, it came out as a melodrama. A complete tonal opposite to the recent Mad Max: Fury Road, On the Beach has all the social commentary and suicidal nihilism, but instead of the colorful visuals and explosive thrills it plays more like an existential soap opera. That's probably a turn-off for many people (and it seems a bit unappealing after the madness of Fury Road), but for what it's trying to do it delivers quite successfully. 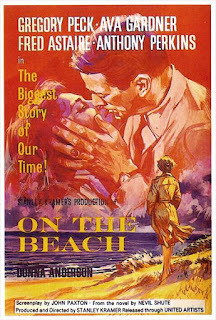 The film is essentially a four-point character study, with the focus on Gregory Peck's submarine captain and Ava Gardner's landlocked widow. Anthony Perkins and Donna Anderson play somewhat smaller parts as a young husband and wife (Perkins is hard to take seriously since he plays exactly the handsome, straight arrow image that Hitchcock completely undermined just one year later in Psycho), and Fred Astaire is cast against type as a jaded scientist. The world has become polluted with roaming clouds of deadly radiation, and everyone on Earth is expected to be dead within 5 years. As we follow these characters around, we see how each of deals with this confrontation with their own mortality. Gregory Peck deals with it by compartmentalizing: he carefully and meticulously focuses on the details on everyday minutiae (this is delivered cinematically in the opening of the film through careful and meticulous cuts as Peck surfaces his sub). Ava Gardner, on the other hand, deals with it by consuming copious amounts of alcohol. In this world that is literally and by definition without hope (everyone knows for certain they will die sooner rather than later), this central couple gives us the two opposite poles of possible emotional reactions: stoicism for Peck, and nihilism for Gardner. Visually, the film is a black and white delight shot by the dynamic and multi-talented Giuseppe Rotunno (a man who worked with directors as diverse as Federico Fellini and Terry Gilliam). Even beyond the beautiful use of light and shadow, Rotunno shoots scenes from expressive angles (including quite a few dutch angles) that turns what could have been a stagy dialogue piece into something much more cinematic. The shot length is also on the long side, not because Rotunno is pulling stunts like we see today (Birdman), but simply because the story is equally unadorned and demands a subtlety in editing which the incredible cast makes look effortless. There's a bit of rear projection in some scenes which is always problematic from a modern standpoint, but it's integrated exceptionally well for its time and even looks passable today. 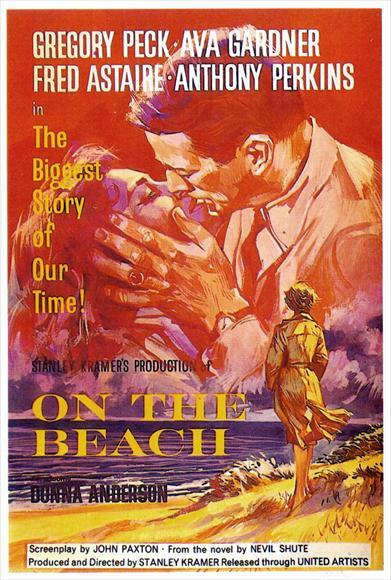 On the Beach is a film which stands out from today's sci-fi dystopias for better or for worse, but whether the bleak, heavy melodrama appeals to you or not, it is a well made piece which deserves a wider audience and belongs in the pantheon on great 1950's science fiction. Andrew Willis and I have launched a podcast, and it's still definitely a work in progress, but we'd love if you give it a listen let us know what you think. It's called Movies Now and Then, and we talk about one new movie and one old movie both individually and comparatively. In the first episode, we tackle On the Beach alongside Mad Max: Fury Road. If that sounds interesting to you, please check us out here.